This post has been sponsored by The Kroger Co. Family of Stores in celebration of #HispanicHeritageMonth. As always, all opinions are my own. 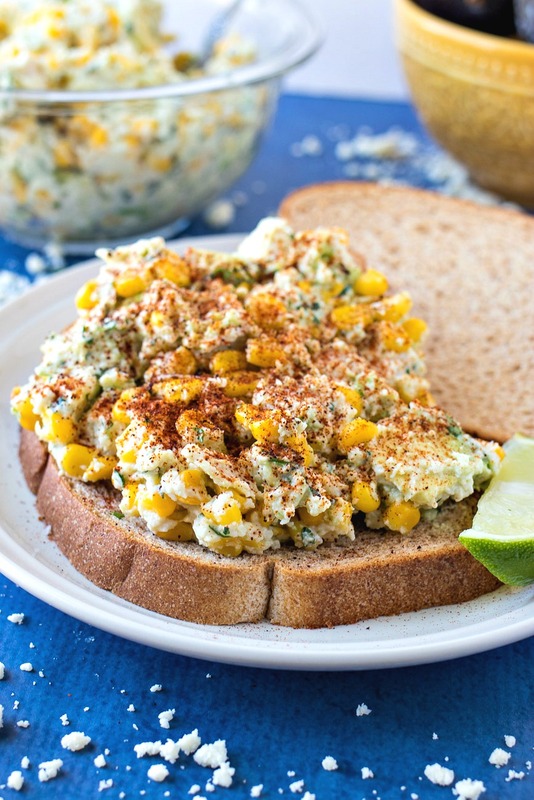 Mexican Street Corn Chicken Salad – All the flavors of Mexican Street Corn are mixed with chopped chicken breast and Greek yogurt to make a flavorful chicken salad that can be eaten as a sandwich or by itself. Today we’ll be talking a little about my heritage so it only seems appropriate to send love to my home state of Florida as they bounce back from Irma. We were hit here in Georgia too, but not even close to how bad Florida was hit. My family is rebuilding just like the rest of you so stay strong – you are not alone in this! The day of September 15 is significant because it is the anniversary of independence for Latin American countries Costa Rica, El Salvador, Guatemala, Honduras and Nicaragua. In addition, Mexico and Chile celebrate their independence days on September 16 and September 18, respectively. Also, Columbus Day or Día de la Raza, which is October 12, falls within this 30-day period. In case you don’t remember, part of my heritage is Colombian. My parents were born in Colombia, though my dad’s family originally hails from Germany and the Netherlands. Needless to say, I have a whole melting pot of cultures that have molded me throughout my life. I am so very proud to have been raised in a culture that was different from many of the students in my classes as a kid. I had a life at home that was unique to all my friends so they loved to hear about it. And let’s be honest, I loved talking about. I have always been a strong believer that my unique heritage has made me much more open-minded and accepting of other cultures. So I am extremely thankful for the life I grew up with and will use this month to remember that. I am happy to join Kroger in celebrating the cultures of all the Hispanic countries during this month. Each week during Hispanic Heritage Month, they’re highlighting the dishes of Hispanic countries and giving them a remix. This week it’s all about the flavors of Mexico. So today’s post is a celebration of a traditional Mexican treat with an American twist. Say hello to my Mexican Street Corn Chicken Salad! Have you ever had Mexican street corn before? It’s also known as elote. It’s corn on the cob covered in a creamy mixture of mayo, lime juice, garlic, and cilantro, and then sprinkled with Cotija cheese and chili powder. In other words, all the most amazing Mexican flavors mixed into one incredible snack. I’ve eaten it quite a few times at Tex-Mex restaurants and even made a dip with the same flavors. But for today’s recipe, I wanted to try it in a whole new way by taking something traditionally American, like chicken salad, and adding in these Mexican flavors for a new take on the classic. I mean, chicken salad has a mayo base, too, so it seemed like a no-brainer! It’s astonishing to me that I hadn’t made thought of this recipe sooner. This chicken salad was out of this world! So cheesy and creamy and bold. Flavor is everything to me so this salad had to have plenty. The biggest punch of flavor in this salad comes from the salty Cotija cheese. Cotija cheese is a crumbly, salty cheese that tastes a little like feta. It really takes this chicken salad to a whole other level. You can easily find Cotija cheese at Kroger in their Hispanic food section in the dairy aisle, along with a whole collection of Cacique products, including various cheeses, cremas, and chorizos. I personally love using their Mexican crema in my creamy salsa verde chicken. For this Mexican street corn chicken salad, I added a fun ingredient that isn’t found in Mexican street corn, but is definitely a staple in Mexican cooking: Avocados from Mexico! Avocados from Mexico are Hass avocados and are the perfect texture for this chicken salad. They add a little extra meatiness but with a creamy finish. Yummm. I talked a little more about my avocado obsession in a post earlier this year with Avocados from Mexico. If you love avocados, you’ll love this salad. Don’t add salt until the salad is complete. The Cotija is pretty salty so I didn’t even need any for mine. Remember: once you add the salt, you can never take it out. So wait until all the ingredients have been mixed together before adding any. Make sure to measure the cilantro before chopping. After herbs are chopped, they have less volume so there is a huge difference between chopped cilantro and unchopped cilantro. If you ever see a recipe that measures herbs in cups rather than tablespoons, it’s probably unchopped. For this recipe, I used frozen corn that I charred a little in a skillet on my stovetop. Feel free to grill up some corn on the cob and slice off the kernels, instead. If you are serving a lot of people with this salad, you can serve it on mini rolls instead of large sandwich bread. I love using ciabatta rolls. I found some in the Kroger deli but you should see some in the freezer section, too. And that’s it – a super simple lunch or entertaining recipe that combines traditional flavors from Mexico with a salad that is made all over America. For more remixed dishes, make sure to check out Kroger’s hub for Hispanic Heritage Month, Sazon Remix. You can even snag a few coupons there for your favorite products, including Cacique and Avocados from Mexico! Check back next week when we continue to celebrate Hispanic Heritage Month with another recipe. But this time, we’re celebrating a delicious drink from Peru! All the flavors of Mexican Street Corn are mixed with chopped chicken breast and Greek yogurt to make a flavorful chicken salad that can be eaten as a sandwich or by itself. Heat olive oil in a large skillet over medium heat. Once hot, add frozen corn and cook until slightly crispy and cooked through (about 10 minutes). Stir occasionally so that the corn won't burn. Remove from heat. In a separate bowl, mix crumbled Cacique cotija cheese, chopped cilantro, cayenne, minced garlic, mayo, Greek yogurt, and lime juice together until creamy and combined. Add corn, diced chicken, and diced avocados and gently toss until combined. Scoop onto slices of bread (I prefer ciabatta rolls), lettuce leaves, or by itself. Sprinkle with a little paprika and enjoy! This looks SO good! Definitely need to try this out soon! Ok, this looks awesome! I need to try this, anything with chicken and avocado is totally up my ally. Holy smokes, what a great idea! I LOOOOOVE Mexican street corn, and this is just taking it up a level! So creative – I’m so glad you thought of this! I’ll be trying it soon! Oh WOW! What a delicious idea! I love all these ingredients… winner winner!! I love street corn and chicken salad and your pictures are making my mouth water! I would have never put this combo together but it looks amazing! I’m so glad I have this recipe pinned to Pinterest! It looks absolutely divine. I spend part of the year in Puerto Vallarta, Mexico, and let me tell you – the feel of this recipe is so authentic. Mexican street corn is sold in the evenings along the Malecon near the Naval Museum. Aw thanks Denay! I am glad this reminds you of the elote straight from Mexico! Dannnnnggg, this looks AMAZING! I actually have pinned a few of your recipes before, but this one looks like it will top the list of things I make on the weekend. Thanks for creating and sharing. Thanks, Ayana! It means so much to me that you like some of my recipes. Let me know when you try any of them out!! YUM! Looks so delicious! A meal in itself! It really is! I don’t even need to eat it with the bread – I was eating it straight out of the bowl! This looks delicious and super healthy too! I love how fresh this looks! Definitely bookmarking this for the weekend! Thanks for sharing. This looks and sounds super yummy. anything mexican catches my eye always! Love thpics too..great job! Thanks so much! I work hard on getting some great, mouth-watering pics for you guys so I am glad you love them! First of all I applaud you on fantastic photos. They make a recipe post so much better. Will try this one for sure! Thank you. Thanks so much! Photography is so important to me so that means a lot! This looks so yummy! Mexican food is my fave, can’t wait to try this recipe! I love elote! This is really unique, I’ll definitely have to try it! This recipe looks absolutely amazing. What a unique way to use corn!! Can’t wait to give it a try! Brb I gotta go wipe the drool off my chin because that looks SO yummy! I will definitely have to try that in the near future! Thanks for sharing! Haha love that! You’re so welcome! This is beautiful and looks so good!! I’ve never made a corn chicken salad, will have to try. Aw thanks so much! You’re gonna love it! Um. Wow. This looks too good! I am def going to save this for later! OMG how good I saved this for later definitely making this asap!! !